Kansas City Voices managing editor, Jessica Conoley, recently spoke with award winning author, Angela Cervantes. 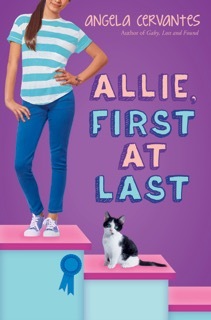 Cervantes’ debut book, Gaby, Lost and Found, was named “Best Youth Chapter Book” by the International Latino Book Awards and a “Bank Street College of Education’s Best Books of 2014.” Her second novel, Allie, First At Last, debuted in Spring 2016. She first showed up on our radar when we published her story, “Ten Hail Mary’s,” in Kansas City Voices Volume 5 back in 2007. Cervantes won our “Best of Prose” award that year. JC: Did you know you wanted to write for kids when you started out? AC: I’ve dreamed of writing books for children since I was a child. However, to be honest, I never thought I was qualified to be a kidlit writer so I stashed that dream away and focused on other things for a long time. Later, when I met my literary agent and she told me that she thought my voice showed great promise for middle grade, it was like a spiritual high-five. Now, I’m writing what I love. JC: How do you get to be a Reading Superhero? And what does a Reading Superhero do? AC: Okay, so I don’t have a cape or mask, but I’ve been chosen by Scholastic to be one of its Summer Reading Superheroes. Who needs a cape when I get to encourage young readers to read over the summer? It’s the best! Every year, Scholastic promotes a Summer Reading Challenge to encourage independent reading among young readers during summer vacation. Everyone knows, or should know by now, that reading during the off-school months is super important for continued learning. This year’s Summer Reading Challenge theme is “Be A Reading Superhero” and our duty is to encourage young readers to read this summer and log their summer reading minutes to earn rewards, AND help set a new world record for summer reading. That’s pretty exciting stuff. I read that last year kids from all 50 states and 28 countries read 286,611,349 minutes. That’s some serious summer reading. For me, the best part of being a superhero is that this Fall, Scholastic will recognize the top school in every state for their summer reading accomplishments and I’ll have the chance to visit the top school in my lovely state of Kansas and present them with their winning plaque. I’m looking forward to this visit in a big way because I love anything that involves reading and giving away prizes. JC: What’s your Kansas City Voices story? And how did our publication of your story, “Ten Hail Mary’s,” affect your writing career? AC: I was lucky enough to have my story win the Kansas City Voice’s “Best Of Prose” in 2007 and, on the same day as the award ceremony, there was a Missouri Juvenile Writers’ Guild conference. There were editors from all of the big publishing houses facilitating workshops at this conference and I felt bad that I had to leave early, but I was scheduled to read my story and accept my award for “Best of Prose” later that afternoon. One of the editors asked why I had to leave early. I explained my reason and showed her my story in the Kansas City Voices magazine. For some reason, I gave her my ONLY copy with a yellow post-it note on the page my story appeared. I ended up having to borrow a copy from writer John Mark Eberhart to read at the ceremony. Two months later, I received an e-mail from the editor. She said that she read my story. She said my voice showed lots of promise. She asked if I would ever consider writing a middle-grade novel and, if so, she’d be happy to read it. Today, she is my agent and we’ve got two books published by Scholastic under our belt and I’m working on a third. JC: Do you believe writers are born, taught, or both? Which is true for you? AC: I’m not sure what is true for me. I don’t know why I chose to write rhyming poems over playing with dolls as a child. I don’t know why I always preferred to tell ghost stories instead of playing beer pong with my friends in high school, but I did and I was encouraged by my friends, teachers, and family to keep going. All I know is that writing is breathing. I don’t think I’ll ever stop until I really have to stop and that part is completely out of my control. JC: Who are some Kansas City based writers or artists we should keep our eye on? AC: There are so many, but I’m a big fan of poet Gustavo Adolfo Aybar. He’s a Cave Canem fellow and 2016 winner of the “Willow Books Literature Prize for Poetry.” I’ve known him since my Latino Writers Collective days and have always admired his poetry. He just released his first chapbook, Between Line Breaks. I still need to get my signed copy. He reads around town, so if you get a chance please check him out.